Joelle has extensive experience of working in both Primary and Secondary schools, as well as in less formal educational settings – arts centres, art galleries, theatres, libraries and prisons – and in higher education. She has been a Guest Lecturer at University of East London, Guildhall and Goldsmiths. She has an Enhanced CRB and Public Liability Insurance. Joelle Taylor is a Subject for Study on the GCSE OCR English Language paper She was the co-ordinator of the first London-wide youth slam Rise Slam, which she organised on behalf of the Mayor of London, in line with the annual anti-racist Rise Festival. The Rise Slam opened eyes and ears to the concept of ‘slam’ and was featured on national radio, television and in just about every broadsheet at some point. It ran from 2001-2007, when it transformed into the national youth slam championships SLAMbassadors UK, with the help of the BBC. Taylor is the founder (2019) and Artistic Director of Borderlines - a new international spoken word youth project (15-25 years) which links 10 UK cities with 7 European countries to discuss the theme of ‘borders’. On March 29th 2019 - as BREXIT comes into effect - the youth of UK and Europe will continue to speak across real and imagined borders in an 8-hour live streamed event broadcast between nations. Joelle Taylor is perhaps best known for her work in secondary schools. 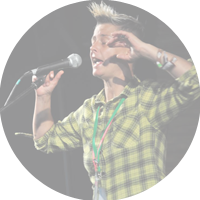 She is the founder and Artistic Director of the Poetry Society’s national solo youth slam championships SLAMbassadors UK from 2001 until 2018, and visits literally hundreds of schools each year – both in the UK and internationally. For full details on SLAMbassadors workshops please go to the website. 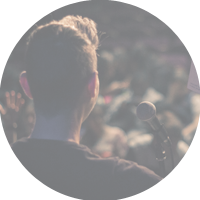 SLAMbassadors UK is the Poetry Society’s dynamic national spoken word championship aimed at 12-18 year olds, which on its inception in 2008 pioneered the use of online technology to submit entries, and to create a national archive of youth poetry. Well-known poets and spoken word artists perform and deliver slam and performance poetry workshops in schools and youth groups, enable the young participants to create their own poems/ raps around the theme of Identity, and then film each young poet performing their poem. These films are then uploaded to the Poetry Society You Tube channel where they are judged by a panel of professional performance poets. Crucially, these films remain as a constant archive of both the artistry of young people and as a socio-political barometer of their thoughts and ideas. SLAMbassadors is as much about the opinions of young people as it is about the forms they choose to write and perform in. It is about speaking the silences, the spaces between words. The project has been responsible for discovering and mentoring a significant number of emerging artists who are now regular faces on the UK and international spoken word scene – including Anthony Anaxagorou, PACE, Kayo Chingonyi, Jay Bernard, NAGA, Jamal Msebele, Aisling Fahey (London Young Poet Laureate), Chris Preddie (awarded an OBE after taking part in the project), Hussain Manawer (television presenter) Vanessa Kisuule (Roundhouse and Hammer and Tongue Slam Champion 2014), Megan Beech and many others. As well as SLAMbassadors masterclasses Joelle also works privately in secondary schools, either through an agency or via direct contact. See below for fees. She has been involved in several primary school slam championships, and recently piloted Junior SLAMbassadors in the Hackney borough. In 2015 the first Tower Hamlets Junior SLAMbassadors was established by the Poetry Society and is now a part of the borough cultural calendar. Joelle has led several INSET sessions for a number of literature development and education based agencies including the Arts Council (A New Direction, Creative Partnerships), Eastside Educational Trust, and the Poetry Society as well as direct bookings from interested schools. She also teaches inset relating to Page Fright, a new project from the Poetry Society which features contemporary spoken word artists covering famous heritage poems, discussing the poems, offering links to sup[porting material and finding connection between heritage poets and their own work in the 21 st century spoken word scene. The Page Fright film is available here, along with a number of supporting resources. Joelle has lead workshops for both teenagers and adults in a number of countries on behalf of the British Council. If you wish Joelle to perform and facilitate sessions in your country, please contact the British Council directly. Joelle also visits schools for both short and long term projects – from a one day workshop to several weeks. Fees are negotiable on longer term projects. We will also charge for travel and accommodation if the journey is not within easy travelling distance of London.